When it comes to long term scheduled investing there are two trains of thought. I will apply both of these to the TSP. The TSP allows you to contribute $18,000/yearly into a retirement account. 1.) 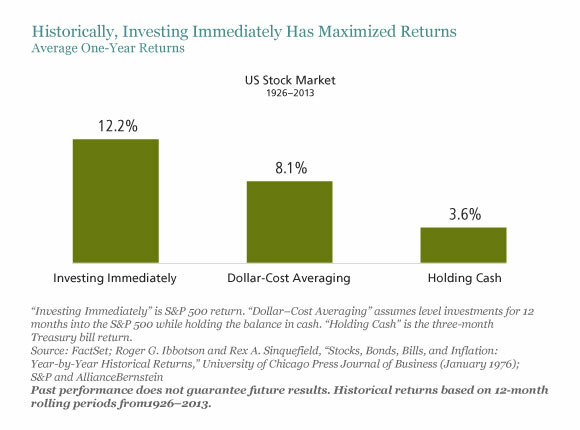 Dollar Cost Averaging - this means putting a fixed amount of money into the TSP every month. Example: Putting $1,500 into the TSP every month. 1.5k x 12mon = 18k. This would allow you to max out the TSP while potentially reducing your risk of incurring a substantial loss resulting from investing the entire "lump sum" just before a fall in the market. Example: The TSP doesn't allow you to max out the $18k during the first month because it is a ratio of your base pay. Because the contributions are based on your military income it will vary on how quickly you could max it out. If your base pay is $4000 and you are contributing to a Roth-TSP it would take 4000x0.6= 2400$/month * 7.5 months = 18k. Whats the benefit of one vs. the other? What do the experts recommend? My opinion: I've always tried to front load my investments because on average the market is always growing. I also try to max out early to fully take advantage of all the dividends throughout the year. Market growth + Dividends > Cash sitting in bank earning basically zilch. I plan to max out the Roth-TSP but I also want to take advantage of the free 5% monthly match. Because of the 5% match I don't want to max out the Roth-TSP too early or i'll miss out the last couple of months. I do however want to try and contribute most of my money during the first part of the year given the advice of the experts that "Lump Sum Investing" is superior to "Dollar Cost Averaging." Given this, I will do the following for my monthly contributions. My base pay is around $4500. The military will match 5% of that so I need to make sure I am contributing at least $225 each month to get the free $225 from the government. Dec - $550 (government matches $225) - I left a little wiggle room at the end in case my math was wrong due to income changing during the year. I am not 100% sure on this but another important note is that it takes 45+ days for your TSP contributions to take effect. For example if I wanted to change my June 15th and June 30th contributions I would have to make changes to my MyPay account sometime between April 1-30th. If I waited until May it would be too late (changes it May wouldn't be reflected until July).